As I continue to read through the e-mails we are receiving, I am finding many physicians have shared personal stories about the challenges they face in everyday practice and specific ways that ABIM programs can be improved in order to be more meaningful. Last week, Todd D. Turner, MD, an infectious diseases specialist from Colorado, responded with his thoughts on the shared values I wrote about earlier this year. I am sharing Dr. Turner’s e-mail, below, with his permission, and the views expressed are his own. Feedback like this is critical as ABIM seeks to design (or re-design) programs so that physicians find them more meaningful. I hope that you will share your thoughts and ideas with me directly at rbaronmd@abim.org. 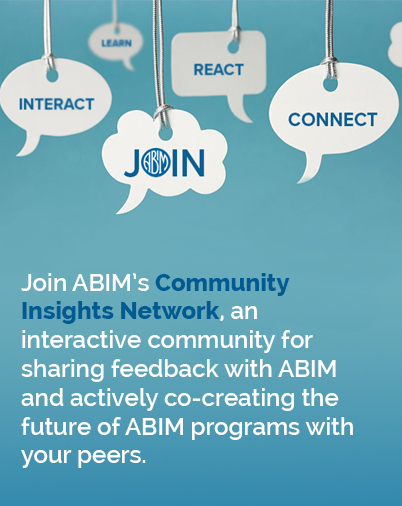 I am listening, ABIM is listening, and we are sincere in our efforts to get it right. As we all come from varied viewpoints under the ABIM umbrella, explaining my circumstance allows for better interpretation of my opinion. I am an infectious diseases [ID] specialist who graduated medical school in 1999 and boarded in internal medicine in 2002 and infectious diseases in 2005. Although I have a 100% ID practice, I have recertified in internal medicine in 2012 and am planning to sit for the upcoming fall 2015 recertification exam in infectious diseases. When I came out of training, the concept of recertification through the boards every 10 years was standard, and although I disagree fundamentally with the concept of grandfathering older diplomates, it was the agreed upon framework circa 1999, and that point is not germane to the topic at hand. The recertification examination also spoke to a strongly held belief that I have that we as physicians are obligated to be knowledgeable and current in our practice of medicine, and ABIM gave us a way to demonstrate that currency in a respected and standardized way to the patients under our care. Even as requirements of MOC expanded to include medical knowledge assessments, I found these to be salient and helpful as education and preparation for the examinations. Everything to that point served the primary focus of what I feel should be the primary mission of ABIM—attesting from a point of authority the achievement of a standard in the practice of medicine for internists and subspecialists. So, fresh out of fellowship training in 2005, boarded in IM and ID, I began to work in the grueling world of private practice, the burdens of which I am aware you have a large amount of familiarity. The board certifications that I had were points of necessity as well as of pride. I became increasingly distressed, however, when the practice improvement modules became a requirement and then subsequently when patient safety and patient voice modules became part of the mix. Fulfilling these things requires surveys of patients and colleagues, I realized. And my patients are majority seriously to critically ill inpatients with only short-term outpatient follow-up in my care who have a bevy of physicians caring for them coincidentally at the most stressful time of their lives; and I am supposed to request of them to fill out not only a baseline survey, but then a follow-up one as well? I expected an atrocious response rate, and I also reflected about how unfair it was to patients to have their physician request this of them. It also was enormously time and resource consuming—both of these things in short supply. And for what? A lofty, idealistic goal of “practice improvement,” which is a difficult thing to objectively measure in the first place. It also seemed to deviate from what I as a diplomate regard as the primary goal of the ABIM. Now no one can argue with a goal of improving the delivery of medical care, but the ABIM must realize that there already exist powerful structures in our system that accomplish these ancillary goals. This is what I as a diplomate want the board certificates hanging on my wall to immediately and unequivocally convey. This is more nebulous. No one will argue that we shouldn’t do this, but how could or should one measure this? Couldn’t one argue that this is already intrinsic to the system as patients will leave a physician’s care or referrers will stop referring if we are unable or unwilling to do this? To have diplomates complete surveys or modules with this goal in mind is superfluous and a waste of resources. This already happens outside of ABIM to a greater extent and with greater effect than having ABIM require modules on this topic. Payers have a lot of QI and patient satisfaction initiatives that impact us directly and immediately without ABIM piling on this topic with low-effect and high-effort modules. This is being accomplished and overseen in the system at a variety of levels also with greater effect than ABIM modules could provide. I locally serve on a physician practice review committee as part of our health system designed to review care outcomes for all of our physicians and intervene with physicians when necessary. Self-reported survey modules to the ABIM on an intermittent basis could never come close to providing the oversight on this point that already exists through safety committees, as above, and state licensing boards. Please do not take this to mean I disagree with any of these four values. Far from it. I only disagree with the ABIM’s increased role in measuring and intervening toward some of these goals, duplicating that which already exists. I am sure that a plurality of diplomates would agree that ABIM’s trend to involvement in these difficult to measure areas is concerning at best, but that the sheer burden of these required modules could lead to alienating a large number of physicians like myself that have held ABIM in high regard for the service that it has done so well over many years. Please know that you have my complete support as you continue to lead the ABIM toward a brighter future. Thank you so much for your attention and dedication to our specialty.